Working closely with the manufacturer of this caliper, we set out to offer a precise caliper that you can count on. We designed our Technician's caliper specifically for band instrument technicians, but gave it the accuracy machinists require, and the toughness needed for industrial applications. This caliper's rugged design will stand up to the abuse of any shop. Working closely with the manufacturer of this caliper, we set out to offer a precise caliper that you can count on. We designed our Technician's caliper specifically for band instrument technicians, but gave it the accuracy machinists require, and the toughness needed for industrial applications. This caliper's rugged design will stand up to the abuse of any shop. The stainless steel casing protects it from oils, greases, solvents, soldering materials, and other hazardous materials present in many repair shops. Our Technicians Caliper is used whenever a machinists caliper is needed and comes standard issue to any new tech at MusicMedic.com. Use this for accurate measurements of rods, thread diameter, bore size, key heights, pad cups, pads, depth of pad cups, pearls, neck tenons, springs, material thicknesses, and any other measuring application where precise measurements are essential. 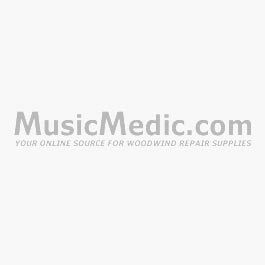 The 6" MusicMedic.com Technician's caliper is the finest and most accurate caliper you will find in this price range anywhere.